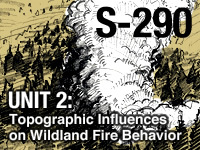 S-290 Unit 2: Topographic Influences on Wildland Fire Behavior provides an overview of how topography affects fuels and the direction and spread of wildland fires. Information on features of topographic maps and estimating slope is also presented. This module is part of the Intermediate Wildland Fire Behavior Course. Quiz questions and information in lesson did not align. On passing scores, correct answers/explanations would be helpful on the questions missed. I like all the interactive parts that keep your mind thinking. Good information. Quiz questions alternate between very easy and sort of ambiguous and unclear. Good visual aids, but it was difficult to understand what the arrows were pointing to on the topo maps. A better explanation of how shading indicates aspect on topographic maps would be helpful. Good information some of the pictures where a little hard to see mostly the topo maps. Just wish I could read the elevations a little easier on the maps. I would like to see the correct answers for questions I missed after taking the quiz. How does a person no what the right answer is to a question they got wrong. Poor teaching practices...! the phrasing in your quizzes tends to be misleading. I often wish I could ask a qualifying question, so as to better interpret what you mean. this leads to incorrect answers that could have been avoided, and is extremely frustrating. Good overview of the subject matter, just not very applicable to my specific situation as a wildland firefighter / burn manager in Florida. Geared toward western fire, as are a lot of these training modules. I liked the audio but the format of the lesson was difficult to follow. It was a little confusing. I find the maps difficult to interpret. Also, it doesn't do any good to not provide the correct answers to questions. Students won't understand why they marked an question incorrectly. learned something I didn't know! The graphics are good, but the topo illustrations need work for them to be instructive. Might help if they were in color or larger. This lesson will be helpful when assisting firefighters on mountain fires in my area. Sure would like to see the correct responses to the questions that I missed on both tries. I think that it could go into more detail on map reading, it skipped over stuff I thought could be useful. I thought the reading the contour lines wasn't explained well enough. Even if you have experience reading topographical maps, if you are unfamiliar with terrain, you will not benefit from this section. I have very limited experience in hills or mountains, so picturing and understanding course content was difficult. The topographic map graphics are very hard to read and the shading is confusing for differentiating between ridgelines and valleys. The lesson itself was good but the topographic maps used as example and quizzes are outdated and are difficult to read. The elevation of the major contour lines should be easily readable or the elevation change between them should noted in the legend. This is important as the readers should be able to quickly understand the elevation data because without them its just a bunch of lines. Some of the questions should also be reworded or more information given such as "navigational compass" as there are drawing compasses that can be used to measure an angle with a string.I would also suggest that there be an interactive picture for aspect tutorial. It would just help if the student can see the the differences of directional aspects of a single hill (mountain) from an aerial view with and a ground view with a north direction reference included. The upper 1/3 slope question and info from the lesson seems off to me. In the quiz:Identifying what the arrow is pointing at on the topographic map. The arrow is massive, and apparently isn't pointing to the west aspect, nor the ridge top. So now I'm to assume it's encompassing the entire south aspect even though the arrow is effectively pointing vaguely in between all three.Shrink the arrow or circle the specific area. The multiple answer questions are confusing. I understand the concepts. The questions are misleading, and not in a clever way. I feel like there was information missing in the lessons that were relevant for answering questions on the quiz. Content was good but performance of software was lacking. could use some better maps. Ones with colors to aid in distinguishing topographical features. Hard to read black numbers over black contour lines. I wish there were more insight on the topographic maps- or a review of how to read topo maps before putting in aspects etc. good course, but more questions on fire predication with aspect would be helpful. once quiz is over you should be able to see the correct answer to the questions you got wrong. Good review of topography, animations/video very good in this unit. More development of skills needed to effectively read a topographical map. Otherwise very clear. Not very user freindly compared to other courses. Question are too open and suggestive. the big arrows on the maps made it a little difficult to know exactly what type of terrain was being indicated. The quizzes need feedback on questions that have been missed and a quick review to ensure student is retaining the information. The animated sections/voiceovers cause my browser to work almost too hard. I had difficulty switching between tabs while working on this section. Great Topo study. Learned quite a bit and some that I didn't. Love the illustrations. Some of the topo maps are very unclear in the lesson. I disagree with the answers to some of the questions or the wording of the question or the maps / graphics (arrow) that are used to define the question. A lot of very good information. The maps are really hard to read and it is very difficult to determine what is being identified. Some of the text labels on topographic maps in the exercises is grainy and difficult to read, making map interpretation tedious, but overall a very good lesson. Quizzes should show correct answers and missed answers to improve learning process. Here, number 6 and number 13 need clarification as the answers seem correct but are marked wrong. Do not like the check all that apply questions much. Picture were misleading in the test. A chimney usually burns more intense than a south facing slope according to the course material dependent on conditions, for example. Some of the map questions are a little ambiguous because the highlighted areas may show more than one feature. Test skipped over questions and I had to go back. You cannot review the lesson once in the quiz mode. This was a very concise lesson on the basics of reading a Topo map. Great. Very informative. Would totally take a class dedicated to topography in the Fire service. The information was good but the topographical maps were hard to read. Either I didn't understand the map orientation or the directional orientation of the topo maps were backwards. The topo section was difficult to understand and did not provide much instruction on how to read a topo map for someone who has no past experience. Test questions are confusing and seem to have subjective answers which is very frustrating. The test did not seem to match up with the lesson. Great lesson. For a person with ADD this section really helped me stay focused. It changes format from listening to a narrator to interactive diagrams and quizzes. It really was easy to understand and grasp. Having very little experience in reading maps, and topography, some of the concepts were difficult to understand at first. This course was able to help me to gain a better understanding of map reading, and fire behavior as it pertains to topography. This lesson can help firefighters be more aware of their surrounds and what to expect, also can help save lives. Good and direct. Just like the lessons on NFA online training. I feel this module was very informative, however I would like to have had more time with Topo maps to better understand what I was looking at. Needs more and better training on the Topo Maps and what to look for in the differences of what the lines mean. Good review of important information since I live in the mountains and we have to respond to wildfires. I like the interactive portions of the lesson. Maps were not very clear especially for first timers. More explanation of the maps and how to read them would be nice. It would be helpful to see on questions that were missed, what the right answer is. Great unit...learned a lot, it was fun! Good lessons, but the practice maps and quiz maps are barely readable. Perhaps a higher resolution map would resolve the problem. Anyone wanting to further their knowledge of wildland fires should take this course. maps were not easy to read and when taking the quiz at the end it shows what you got right and what you got wrong but i noticed that some of the answer i got wrong were not in the same order as the quiz. Example question 1 was just a question witch i new the correct answer and question 4 was a pic of a topo map that i got wrong but when it gave you the final score it showed question 1 as the topo map and marked wrong. Please keep the things the same from when you take the quiz to when you look at final score. Concise and clear. Didn't waste any time but included all the info I wanted. The examples of topographic maps used in this lesson and the accompanying quiz are fairly low-resolution, making it difficult to distinguish the elevations and to read in general, thus making it difficult to answer the questions accurately. INTERESANTE PERO FALTA PROFUNDIZAR EL APRENDIZAJE DE MAPAS TOPOGRÁFICOS. Show the answers students gave and the correct answers for the quiz. I only saw the amount of points I got, not what I answered correctly or what the correct answer was. Hard to learn the right thing if you don't even show the right answer. I still don't fully understand topographic maps and I feel like this does not do a good job at explaining how to determine a canyon from a ridge from a valley. I would like to see more than a circled area on a map and a term going with it. The questions on the quiz were very badly worded, it took a simple topic and made it overly complicated but using unclear language and providing answers that did not seem to fit well with the topic. I found the images with contours to be a little hard to read. needs to be more clear on what the arrows point at on the topo maps. Although the module covers contour maps, I still had some trouble making sense of them. But overall, great course. The topographic map part of the lesson could have explained the different topographic features better. The map was too busy and difficult to understand for someone trying to understand it for the first time. if i cant see what i got wrong on the quiz how am i supposed to fix the problem/ learn from my mistake???????? Topo maps are hard to read. Some questions are very ambiguous. I would like to able to see the answers for the Beta Quizzes. in order to understand what I had gotten wrong and why. So that way I can focus on the things I had less understanding on. Topo maps elevations are nearly impossible to read and then quiz questions reference these poor maps. Same complaints about topo maps (Very poorly labeled) and again, no correct answers at the end of the quiz. As stated topo maps are hard to read, questions at end of quiz show no correct answer. The elevations on topo maps are very hard to read. All topo maps need improvement. Improvements to topo maps need to be made, more time spent on teaching about different parts of the map. Topo maps bad. Many multiple answer questions I felt were ambiguous. So far so good. My only criticism is that the answers are not shown after then end of the quiz. topo maps were very difficult to understand. Please rewrite this section. Quiz was a fair one, however, how can we learn from our mistakes if you dont give us the correct answers or at least tell us what the wrong ones were. In the final quiz there is a question that ask you "at what point on the described topography map will there be the most intense fire behavior? I had some trouble locating this point.. I was thinking it would be helpful to implement a little more learning tools on how to read topography on those maps. Such as the "v"'s on the maps what do they mean? how to spot out drainages, identify slopes.. these sorts of things. Overall a great Unit. Thanks! Topo maps are poor and unclear. This module was very easy to understand and to learn from. The comments below say that the topo maps are hard to read. I disagree. I have never before known how to read a topo map and because of this module, I now have a basic understanding on how to read them. I recommend this module for any one interested in wild fires or who lives in a wildfire prone area. For the record I am not a firefighter, just an ordinary person, and I found this module very easy to understand and very fun to learn from. i feel the maps were relatively good. although the explanation and exercise involving location of ridge aspects and features could use a minor tune up or more simple example. the west and east slope aspects are backwards. worst topo maps ive ever seen, basically useless and a real hindrance to learning as they are used so often, a great topic but far from crystal clear coverage of it. The topo maps could be of a higher resolution. Good content in this unit. I found myself making a word document with the content on the slides as self-study material. I have not been able to work the download option for this course but I feel that content would serve the same purpose. i hope the rest of the units are more like this one and less like the first. Upon completion of this unit, students will be able to: 1. Identify standard features on a topographic map. 2. Describe how topography affects fuels and their availability for combustion. 3. Describe how topography can affect the direction and rate of spread of wildfires. 4. Describe how changes in fuels and topography can provide full and partial barriers to the spread of wildland fires. 5. Describe how slope percent can be determined or estimated in the field and understand its effects on fire behavior.